Now, I have one hell of an imagination (as most of you know), but what eleven year old kid, when given a school essay to write, would dream up a story about bomb disposal? Author and writing extraordinaire, Chris Nickson. That’s who. From that moment on, Chris realised he was born to be a storyteller. Um, yeah, no kidding. Leeds-born Chris moved to the good old U S of A at the tender age of 21, where he stayed for thirty years. To top that, he’s also a singer-songwriter and guitarist. However, maybe you know the name ‘Chris Nickson’ if you have a love for celebrity biographies. Chris has written several including ones for Will Smith, David Boreanaz, Ewan McGreggor, Mariah Carey, and Superhero Christopher Reeve. No, still haven’t heard of him? Even though he has published over 28 non-fiction books? What rock have you guys been hiding under? 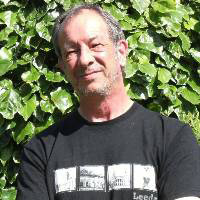 Chris is also author of the Richard Nottingham Series. 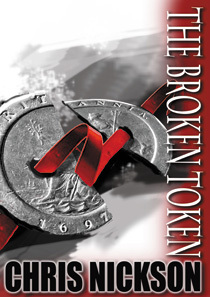 The first, The Broken Token, was published in 2010. 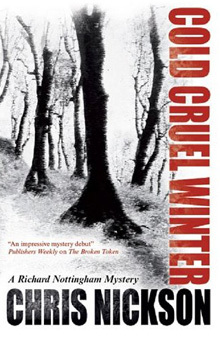 This was followed in 2011 with Cold Cruel Winter, which was subsequently named one of the 10 Best Mysteries of 2011 by Library Journal. 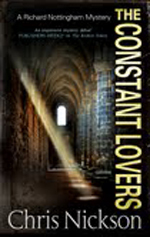 And Creme De La Crime has just released Constant Lovers, the third in the series. It’s US release date is set for May 1st, 2012. Come the Fear, the fourth book in the Richard Nottingham series will be released in the UK in July 2012. Also, 2011 saw the e-book release of late singer-songwriter John Martyn’s biography: ‘Solid Air: The Life of John Martyn’. So, let’s see what self-confessed Yorkshireman and devotee of good tea and digestive biscuits made of our interview. You introduce me to the most wonderful people. Thank you, Donna! You’re welcome. I must admit, Chris is a really nice guy! Yep, definitely hiding under a rock! LOL! But what a great writing career eh? Thanks Donna for another inspiring interview! Lol! I wouldn’t have it any other way. I am here to be abused! I feel like one of those stress balls. LOVE it! It just goes to show you that people can make solid careers as writers, even when they’re not as well known. Very inspirational, Donna! I know what you mean, Jenny. After writing these bio’s every week, it really inspires me to crack on with my novel! Oh gosh! A blast from the past. His book on David Boreanaz I bought once upon a time in my Buffy phase. I found the book recently, actually. Can’t believe I still have it after all these years. Awesome!